I love this table. Exactly as pictured. Light - easy to move. Perfect petite side table. I purchased it to liven up my guest bedroom. This gem is sitting level on a golden oak wood floor next to a turquoise chair. It's a tasteful bit of shiny that gives the room a pop and accessorizes like your favorite piece of jewelry. If I had a need, I would definitely purchase another one. VERY pleased! Steelworks chalice aluminum stool features a contemporary style andtimeless look and feel. 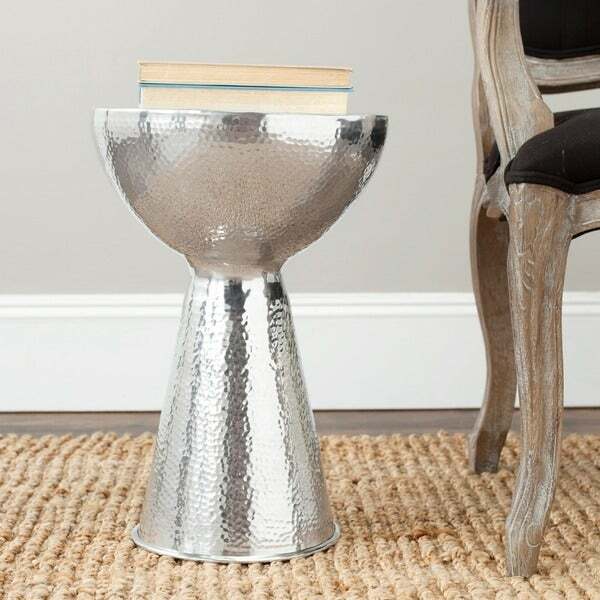 Constructed with a sturdy aluminum frame,this stool features an intricate chalice design. This work of artis easy to decorate with and is a welcome additional to anysetting. Dimensions 17.7 in. H. x 12.2 in. W. x 12.2 in D.
This is much smaller than a stool. Very nice though. Good for an accent piece. Nice quality. Too little for a stool! The stools looked great but were smaller than I was thinking. I love this little stool, which we are using as a small cocktail table to set drinks near other smaller-scale furniture. It is stylish and different. It is small, but that is exactly what I needed. my wife bought this and it first I was against it because its really light but once the rest of the furniture went up it really made a difference. Recommend purchasing with the Round one as well. they make a great combo. well they look just like the picture, I had been pricing similar items for a while and the prices were ridiculous. This is a great deal..... one thing I must say is they are a little smaller than I expected but still a nice size and perfect for end tables. I purchased this to use a coffee table and put a 37" piece of glass on it and it looks great!! I read all the reviews ahead of time, so I knew what to expect. I love the piece. It is an accent corner piece at the top of my staircase, and it looks beautiful there. This piece goes well with the sahari/ modern vibe that I'm going for in my apt. Very nice piece! Had to send it back, it was very uneven when It's on the floor. Was afraid if I put something on it it will topple over. The stool is well made and pretty but it is very small. I have a small house, and it is STILL too small for the room I put it in. I think it would have been a much more functional piece had the company made it about 5-6" taller and larger in circumference. Then, it would have fit the bill. "What is the weight limit of this item?" Hello, we do not currently weight test items and apologize for any inconvenience. Thank you for shopping with us. "Does the top of this stool dip down in the middle, or is it flat enough on top so that it could be used as a small cocktail table to set a drink?" Hello carolrod111, we appreciate your inquiry. This item is flat, so it could be used as a small cocktail table. We hope this information has been helpful. Thank you for shopping with us. Have a great day! "what is this a sitting stool or an end table"
Thank you for your interest. This item is a stool.